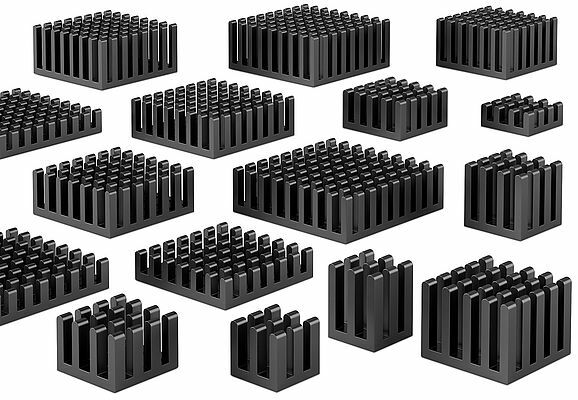 Fischer Elektronik has added heatsinks to its ball grid array casings, a solution for thermal dissipation of electronic devices or integrated circuitry called ICK BGA. The casing design BGA has connections on the lower surface of the device for the formerly advised integrated circuitry. Those connections in the form of solder balls are applied side by side in a x/y pattern and will be fused during the reflow-soldering. An optimal connection between device and contact pad is given on the PCB. To avoid damaging this connection by mechanical stress the ICK BGA heatsinks from Fischer Elektronik are reduced in weight and adjusted specially to the geometrical dimension of the BGA devices. The product expansion contains the dimensions 11x11, 15x15, 19x19, 25x25, 29x29 and 33x33mm. Additionally you can select between the fin height of the heatsink from 6, 10 and 14mm. All designs include a so-called omnidirectional fin structure whereby individual pin fins can result on the top side of the heatsink. The shape of the pin fins allows a good heat dissipation at free convection, but especially at circulating air whereas the airflow is also supported by the heatsink geometry. The single variants show a very good flatness with which a mounting of the BGA device can be done by means of thermal conductive glue or special double-sided adhesive foils which are specially cut to the seize of the device. In addition to the standard program of ICK BGA heatsinks the surfaces, mechanical work and special designs can be realized according to customer specifications.